Perfect! …and I do mean Perfect! 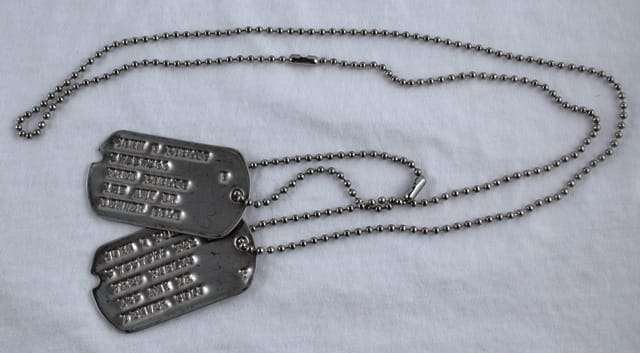 These tags and M-1940 chain are identical to my original dog tags of so many years ago. Thanks, men, for doing such a great job. I do not have words to accurately describe my comple satisfaction with you product. Thanks and job well done. I had a couple of simple questions that were answered quickly. My order arrived promptly and was done exactly to my order. I love my WWII Dog Tags. Great job. Received my dog tags today and they are GREAT! Customer service was awesome! Thanks for a great set of tags! I found WWII Dogtags years ago while starting my 504 pir impression. This was my fourth set. Ordered for my cousin. Fast accurate and well made. Great addition to any impression. Exactly what was ordered for a great price and very fast turnaround. Highly recommend! Thanks. Outstanding quality and fast delivery! Outstanding products and service. Website was very helpful in deciding format to use. Very pleased with the results. Products were exactly as advertised. Incredibly speedy service and delivery. There are many people banging out “dog tags,” but Lance is the ONLY one I’ve found who can make a true WWII identification tag. They’re dead on! 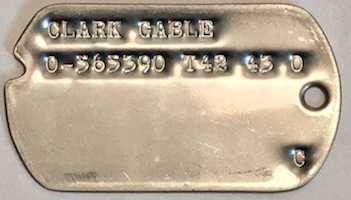 There are many folks who can punch out a dog tag, but in my picky opinion, this is the ONLY place that understands the WWII identification tag process. The tags are dead on and they’ll make sure you get what you requested. Always on point! Thank you for yet another set of period accurate dog tags. I always appreciate the fast shipping as well! Great piece for commemorating the ultimate sacrifice of my late Uncle. One question and one suggestion though with regard to the original 1944 chain. Is it supposed to come in 2 pieces? 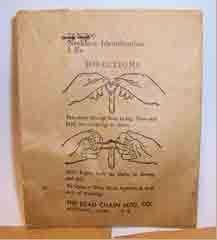 And second, I would suggest you don’t tape the original chain packet since it has pretty cool old timey instructions that get smudged when you remove it. Exactly what I wanted. I wanted replica tags to honor my dad. I’m thinking these will make a wonderful Christmas gift for his grandson. Great service and quality. Thank you very much. Yet another example to forever honor “the greatest generation”, among them my still kicking 98 year old dad! Great product but I didn’t realize it was for a pair. I purchased two and received 2 pairs. Still a great product. These were awesome. We wore these as we flew on the B29 FiFi in Colorado in remembrance of my grandpa Marshall Simcox, who was a B29 pilot. I would definitely by again. Great product! Can’t tell any difference between these and the originals. Will be perfect for my airborne impression! Thanks! I wanted Dog tags to match my grandfathers to give to my kids for memorial day. These were a exact replica of his from WWII, just new. except for the aging on the original, they are indistinguishable. EXCELLENT !!! Superb Customer Service ~ Tags are simply AMAZING !! Thank You for putting so much love and care into these ! Highly Recommend this shop to anyone and everyone looking for reproduction dog tags ~ Thank You So Much !! I’ve always felt badly about losing my Dads WWII dog tags as a kid. I was so proud to get these replicas and they are perfect. They hang on the flag case from his funeral. Outstanding service! Outstanding quality! Very fast delivery! The dogtags are top-notch. The Website was great in taking the guess work out of what goes where. Very pleased with these and will be ordering more. A quality product, I was very happy the way it turned out. 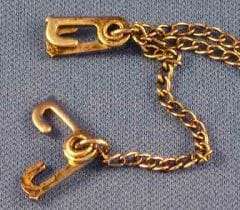 Well made dog tags, sturdy chains, and especially, excellent information on what to fill out for historically accurate tags. The order took a bit to get here, but that’s the result of it being from such a specialized company. Overall: if you’re on the fence, jump it. Top notch!! Lance sets the bar for fast quality service. Great set of tags! Thank you! Fantastic tags. Well made, look great and amazing customer service! The dog tags are a perfect match to the ones issued to my father during WWII. Thank you. Arrived in a timley fashion and look stunning. very happy with the quality. Thank you very much WWII Dog Tags! They arrived quickly. The quality was excellent and the price was good. They look great. 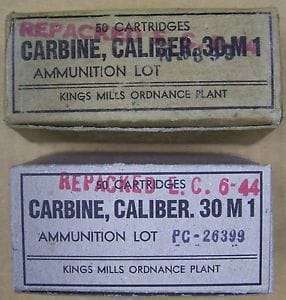 They will be a very nice addition to my WWII display and I will wear them when doing reenactment’s. Thank You. Excellent reproduction and very fast shipping. Will definitely order from again. I’m putting together a shadow box for a ww2 vets son and the dog tags will be a great addition to complete the project thumbs up too wwiidogtags. These things are identical in style to my great-uncle’s original set from his days in the USAAC. These look just like the originals. I’m very happy with them. They are going to look great in the shadow box. Exactly what I wanted.Identical to originals. Quick turnaround. Great price. The serial number generator is an easy to use tool/function. Exactly what I expected! This was my second set for one of my grandfathers display case. I’m very happy, thank you. I am very happy with my WW2 dog tags & original chain. Lance was very helpful, highly recommended !!! My Uncle was a survivor of the Death March of Bataan, then put on a jap ship, bombed once, he was one of 10 survivors, put on second ship, bombed again, and there were no survivors, nd his remains never found. I had always hoped his remain would be found, and dog tags returned, howvere since this will most likely never happe, I just ordered some exact duplicates. THis company was excellent to deal with, as is the product!! Good quality and different options available. Shipped quickly, fair price. Would buy another set if needed. These are a replica of my dad’s tags. He is no longer with us but I feel he would be proud for me to have these. He was a wwII pow and I don’t know if he had his tags when he got home, but if he were alive today he would proudly display these as I will do. Thank you so much. PAULA. These tags are exactly what I was hoping they’d be. They look just like original WWII dog tags. Outstanding service and shipped quickly. I originally ordered a set from another vender and when I rec’d them three weeks later I threw them in the trash, they were horrible! I decided to give you a try and when I received them 10 days later I couldn’t have been happier! Great job and they look like the real thing. Thank you! Very nice dog tags, correct and very fast. 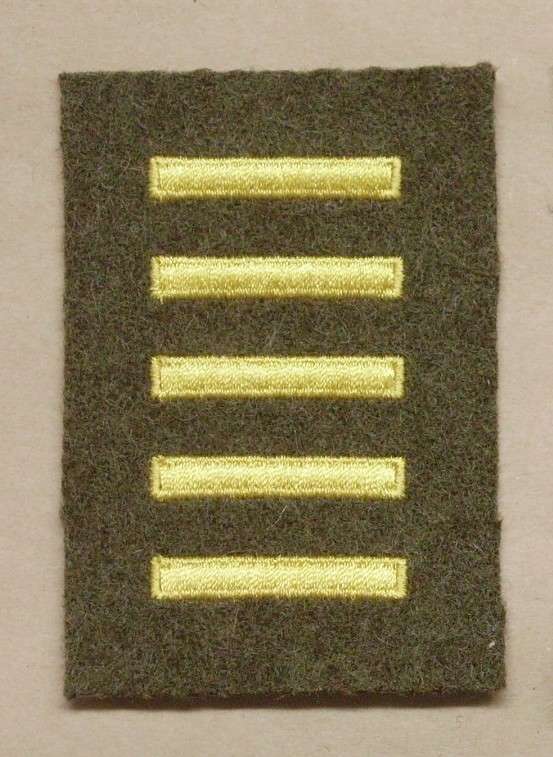 This is a great addition to my WW2 kit. All most all my guys have dog tags from you. Thank you very much. 36th Recon Living History Group. Highly recommend this site!! Excellent workmanship and exceptional customer service. Thanks Lance! Awesome tags, very fast shipping and great quality. Thanks Lance! All 5-star ratings and well deserved. The two sets of tags are for my three Niece’s because they want Grandfather’s dog tags to wear. The tags received are virtually identical to the 75 year old original I have on my key chain. It’s like they were made on the same machine with the same letter stamps! Excellent work! A very positive experience. Great customer service & communication. Excellent work done in a timely fashion that I needed for my niece’s Christmas present. I highly recommend them. great work, exactly as described. have ordered before and will again! Duplicated my dad’s dog tags issued in 1942. Original tags had been in the stamping machine twice, second time to add in additional tetanus shot date. Great job! Thanks. Absolutely perfect. Getting ready to produce 3 sets of my father’s tags to keep and give to my brothers. Just bought three sets of dog tags that had my father’s info on them. They were absolutely perfect. It was identical to my father’s dog tags. I gave a set to my brothers and kept one for me. My brothers absolutely loved them. Thanks so much. I can now put my father’s dog tags back in a protective display and wear the copy for myself. 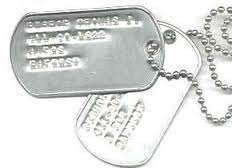 I will continue to shop here for my dog tags and will recommend to my friends as well. Did business with them to purchase a reproduction of my Granddad’s dog tags from WW2. Not only did they look great, the time to make them and ship them was perfect. Will def do business with them again soon. After my Dad gave my nephew his original dog tags from WW2 before he passed away my sister was very upset as she was very close to my Dad. When I found your website and discovered I could order duplicates of the originals, it was an answer to prayer. They looked exactly like the originals and my sister is very happy. Had two sets made for my son and I for reenactments and they look great. They look just like the originals that I’ve seen and they came in a reasonable amount of time! I’m very happy and would do business with them again! Very fast shipping well made and for a good price. Excellent! We bought a set each for our seven year old son and eight year old daughter. Lance was very helpful getting these right. We are teaching our kids about ww2 and these are a great tool to help them better understand our history. The kids haven’t taken them off and they have been jingling around the house since they arrived! Thanks again! Awesome! Perfect in every way. Shipped quickly too. Simply put, great tags for the reenactor or everyday use. The other reviews speak for themselves. The tags are extremely nice, I am well pleased and I will tell friends if they are looking for replacements, this is the place to go. Perfect. I’d been looking for a quality reproduction WWII dog tag, and based on all of the five-star reviews, I chose WWII dog tags and they did not disappoint! Wonderful product. Great product, appreciate the template and speedy shipping! Perfect addition to my grandfather’s memorial case. I looked around at several sites offering dog tags, this one had the best information and reviews. Thank you Lance! These are wonderful! I’m looking forward to the look on my Grandma’s face when I give these to her for Christmas in memory of my Grandpa. Lance did an outstanding job making custom-ordered WWII dog tags for me! I had a few questions, which he answered quickly then had an extremely quick turnaround once the order was placed. The website was very helpful and easy to navigate. I’m extremely pleased with the results and will be coming back! Great addition to a collection of dog tags of Citadel alumni buried overseas in ABMC cemeteries. These dog tags are the best by far. I ordered these in hopes to keep my grandfathers legacy from the war going and it is. I’m honored to say that WWII Dog Tags made a perfect copy of my grandfathers tags and made it possible for his memory to live on even more than it already has. Great product. 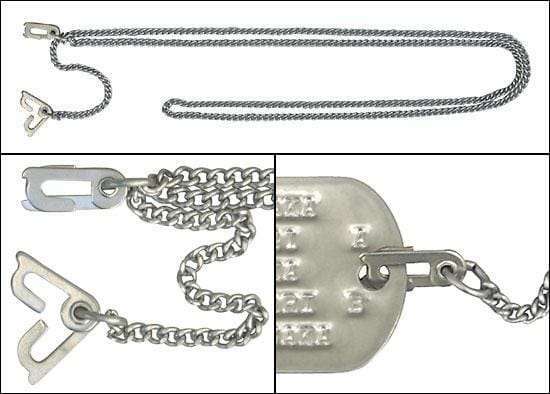 Dog tags are a high quality reproduction of originals. Easy to order, good price, quality of the product is great and fast shipping. What else do you need? I highly recommend for all your reenactment needs. Also love my original wwii beaded dog tag chain! Nothing beats it, except originals. Great product! Great people to do business with!